I'm from FL— when in the USA. Salsa is common. In fact, it’s not just common, it’s VERY common there. But that's FL. I'm in Poland. It's not the case here. But then maybe I’m being picky. Here we have one kind called Mexican sauce and it looks like this. 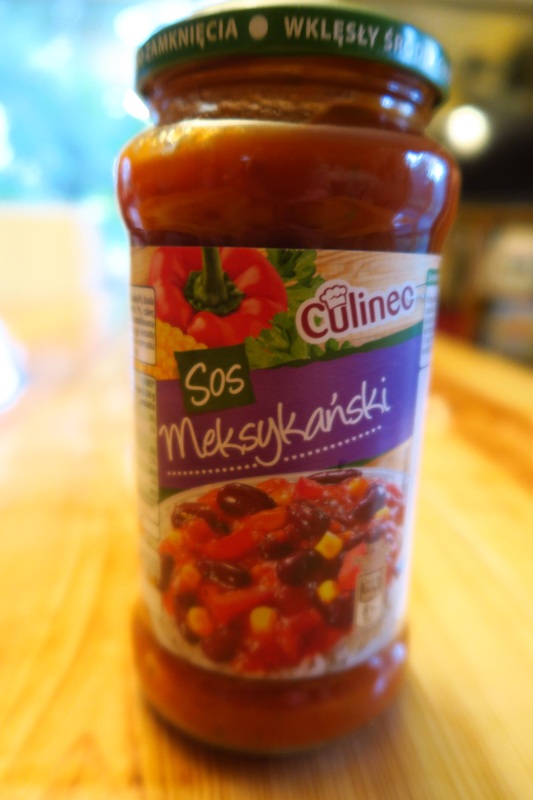 The list of ingredients is very long, and while tomatoes are at the top, just under water, it's full of other things - including sugars, glucose, and thickeners. While not “bad'“, it’s not really good either. At least not for what I want it for! Ingredients: water, tomatoes 22%, tomato paste/concentrate 10%, onion 8%, red kidney beans, 6%, glucose/fructose corn syrup 3%, sugar, red pepper 2.5%, green pepper 2.5%, modified corn starch, salt, rapeseed oil, spices (may contain soy), spice extract, citric acid, herbs including parsley, vegetable extract, smells, may container celery root. I began making my own salsa to can a few years ago and I've not looked back since. It's fun. It's good tasting and the price is right! Plus I know what's in it. I had almost completely run out of salsa - completely out. I made it the last time two years ago so it was time to do it again. 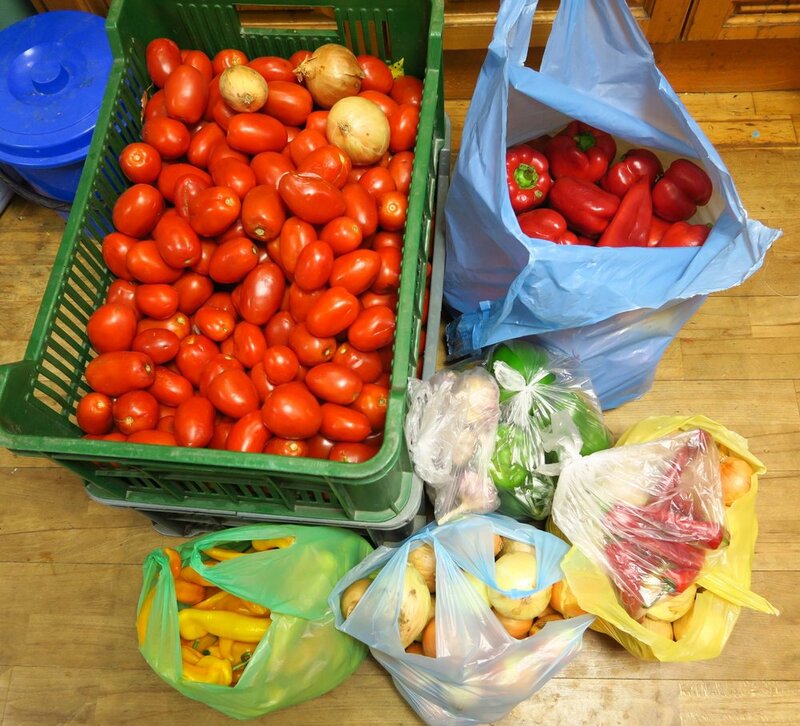 On Monday we went to the bazaar/open market and bought 40 kg of tomatoes (cost 60 zl or $16.13 at today's exchange rate). I added onions and red/yellow peppers and it doubled the cost. Then I went to the grocery story and bought some green peppers and hot peppers, and some garlic and I was ready to begin. After bringing all the produce in the house, I got started at about 8:15 am. I had wanted to get an early start, but didn’t. First thing i did was to begin to wash the tomatoes, cut out any bad spots and cut off the stem end. I was preparing them for “scorching”. Yes, you read that right. I was taught this by a lady who used to live in Mexico. I had thought my salsa just lacked that “extra” and she told me. I thought it was so strange, but I tried it and I thought it was just what my salsa was missing. So, I scorched or burned the washed tomatoes, whole either in a pot on the stove or in the oven on broil. I then repeated the same thing with the peppers - red, yellow and green, and hot peppers, onions and even the garlic. That was a massive task! I had a helper come over about 9 am and he helped me cut and wash and do the food prep. It was wonderful. Thanks, Sylwek! He was my youngest son’s good buddy when he was still here. After we got all the produce cut and scorched, we ran it through the food processor to get chunks My helper, Sylwek, did all the grinding. This container was full. Very full. It wouldn’t hold even another 1/4 cup of salsa! We then took it out of this container and put it into pots for cooking down to get rid of extra water. I have 4 burners on my stove, so I used all four burners, my crock pot and another electric pot that cooks extra fast. I wanted to cook off extra water and make the salsa thicker without using thickeners like corn starch or flour. When it was cooked down to the consistency I wanted, I then began to put it into jars and then boiling water bath - the small jars for 20 min and the larger ones, 25 min. I really wanted to put it all into small jars now that it’s just the two of us at home, but I didn’t have enough small jars, so I used some big ones. I ended up with 55 total jars. I finished pulling the last jars out of the boiling water bath at just before 8 pm. It took all day. Yep. All day. But I’m done for at least a year. I had to show you the final result - all that produce at the beginning made this - these jars of salsa and compost. At least with this salsa, I know what’s in it - just veggies and some spices! No sugar, no thickeners and nothing that I don’t know what it is! Ingredients: tomatoes, onion - sweet and regular, sweet red peppers, sweet yellow peppers, green peppers, hot red peppers, garlic, spices which include - smoked, dried jalapeno peppers, garlic salt, salt, dried cilantro, cumin, marjoram. And now you know - I had a complete break from my sewing room today (Tuesday)! Not really sure what to call this color. Imagine a dark rose from the 70's mixed with a little bit of dark red that's not super concentrated. That's what you've got with this one.